Its nearly time to pack my bags and start the 23 hour journey to Malawi, and I'm getting mega excited! A couple of weeks ago I was very panicky about the amount of things I still had to do before I went, but on Sunday I actually finished last week's todo list and realised that the majority of the items on this week's huge list were really quick jobs. So, with three sleeps to go, I'm almost ready and taking it easy in preparation for the tiredness that's to come. I'm incredibly impressed with my time management skills that have somehow allowed me this easy few days. The last couple of weeks have been amazing, but tiring. We raised £320 at the Decades Disco on the 10th, which was fantastic. I think everyone had a good time, but I had slightly cracked under the strain and the tiredness, and was beyond judging other people's body language properly. I danced lots, and everyone else danced lots, and we raised lots of money for the project. I've been travelling round Fife meeting up with artists who have donated work to the art raffle. Even though we all do Open Studios together, we don't meet up very often, and I met lots of artists I'd not met before. Thanks to all of you for donating an artwork. 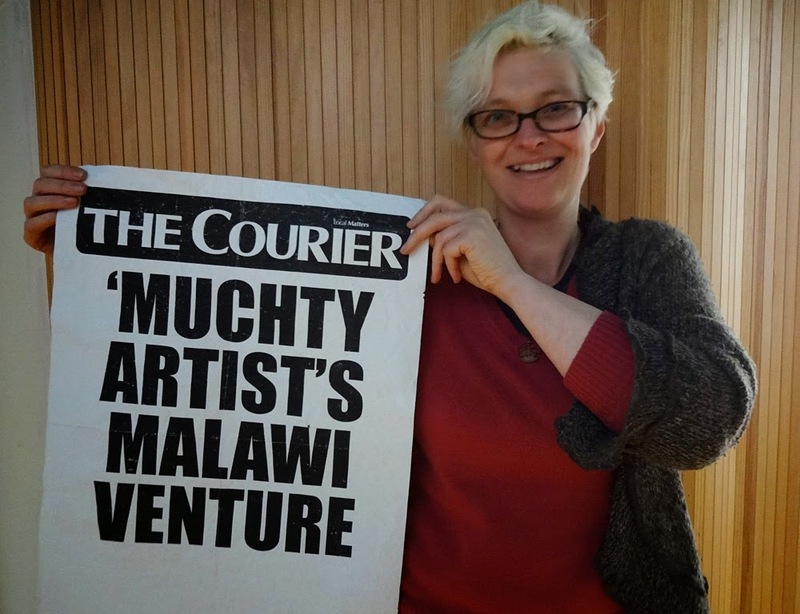 The Dundee Courier printed a wonderful article about the project, and I was shocked to discover that I was the headline news for the day. Wow. But even this achievement was eclipsed this week, when on Tuesday I was filmed talking about the project for the local telly! The resulting film is incredible, and I'm sorry I can't put a link up for you to see it, but The News only stays up on the STV site for 24 hours. They plan to do a follow up piece when I return, so hopefully you'll see that one if you missed this one. I forgot to mention some really basic things in the film like: the name of the project, and the fact that I haven't got any 'official' funding for the project and need sponsorship. Major woops. The reason why I forgot to say things is that I didn't include them in my interview notes because they were so fundamentally basic that I thought I'd remember them. This is not a mistake I'll make again. You have to answer the questions they ask you, but you have to make sure you manage to talk about the bits you want to talk about too. Just like in a job interview. A few days I was given some advice from a friend who told me to make sure I got to a point where I could enjoy myself, and enjoy the experience without being so stressed out by everything I need to do. I think this has finally happened Marilyn. I'm nervous certainly, but I'm mostly calm and sleeping well, and I have this huge bubble of excitement in me at all times that makes me want to giggle. I can't believe this is actually happening, or how big this project has gotten. I'll be updating this blog every few days while I'm in Malawi, so keep an eye out for changes. Have an enjoyable time while doing what you know best! Hope you enjoy every moment and looking forward to hearing your experience and achievement! Good luck! Thanks Vincent. I'm hoping to make good use of my Chichewa lessons while I'm out there.